All across the Internet, people are celebrating 25 years of Apple's Macintosh computer. From heartfelt tributes about the first time they touched the IIe to fond remembrances of Apple's less-than-prosperous ideas, stories are flowing about one of the most inspirational and influential companies ever. CNET fondly revisits Apple's famous 1984-tinged Super Bowl commercial and Apple's other advertising campaigns, which have all set the company apart from its competition and detractors as an innovator daring to think different (and inspired both competitors and creative parodies). "In the entertainment industry, it was the dawn of the cinematic Super Bowl ad," writes Caroline McCarthy. "For historians, it was a notable moment in Soviet-tinged pop culture. 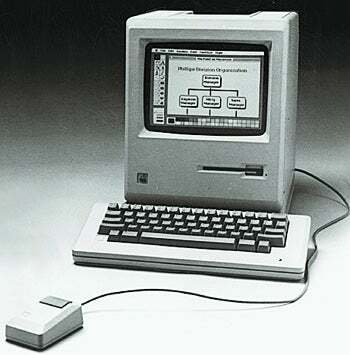 But in the tech world, this was the birth of Apple as we know it -- 25 years ago this week." Gizmodo also applauds the 1984 commercial and delves into its more technical aspects. Gizmodo's writers also take a time-out for some sentimental praise: "With one single emission, it generated millions of dollars in free coverage and re-runs in TV stations through the nation and abroad, and became a historical landmark to advertisers, companies, and public alike." MacRumors stumbled upon an inspiring speech given by COO Tim Cook during Wednesday's earnings conference call. When asked about Steve Jobs' medical leave of absence, Cook launched into Apple's philosophy on how it builds, functions, and innovates. Part of the text reads: "We believe that we're on the face of the Earth to make great products, and that's not changing. We're constantly focusing on innovating. We believe in the simple, not the complex.... We believe in saying no to thousands of projects so that we can really focus on the few that are truly important and meaningful to us." Cook's impromptu pulpit pounder might illuminate better than any historical timeline the drive and impact Apple, and the Macintosh, has had upon the technology industry. For serious in-depth coverage of Apple's anniversary, check out Macworld's multi-part series exploring everything from software, to icons, to some of Apple's less than prosperous inventions. Iain Thompson writes for vunet.com about why he still hates Macs. His acid-laced diatribes include bits like, "the Mac moved from being a useful tool to something to be loathed," and "One of the key reasons I hate Macs are their users. There's a certain kind of smug, snooty Apple user that makes me want to reach for the EMP cannon. Apple's fan base bears more resemblance to cults like Scientology than many would like to admit." Ouch. Thompson writes for all you out there who aren't so keen on celebrating any aspect of Apple's history. The Telegraph looks back with skepticism, and posits that Apple wasn't actually quite so much an innovator as it was a "refiner." Sadly, the quietest site on the web is Apple.com, which has a unique opportunity to revisit its history and chart the growth of its role in home computing. But ever the nonconformist, one can only think that Apple chooses to look forward, into future possibilities and innovations, rather than consider the past.